PowerRack modules are fitted in a 19 inches cabinet for space saving and increased energy density. Standard 19 inches cabinet format allow to be fully compatible with some professional application such as back-up telecom batteries, UPS systems, sub-station, and some industrial systems. 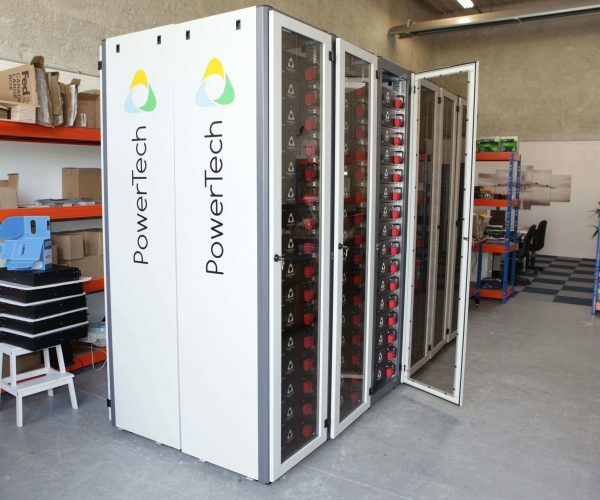 PowerTech Systems has rigorously selected and tested best-in-class Lithium Iron Phosphate cells that are assembled in this product, in order to provide high lifespan and performance. Lithium Iron Phosphate (LFP) is currently the best solution for storing energy, because of its durability, its high security and its technical superiority compared to other technologies on the market. PowerRack system uses our BMSMatrix Technology to handle various combinations of ESS configuration. BMSMatrix® is an advanced technology from our R & D, which enables the deployment, control and management of large battery systems. BMSMatrix® is the embedded intelligence providing an incredible modularity and scalability to the system: PowerRack can manage ESS as small as 2.5kWh-48V, but can easily scale up to some large ESS of more than 1MWh-1000V. PowerRack has a built-in multi-protocol interface to communicate with external controllers (SCADA, Inverters, PLC, etc). Communication interface can be fine-tuned to fit with specific applications. Protocol supported are CAN, CAN Open, RS232, RS485, HTTP via API REST.